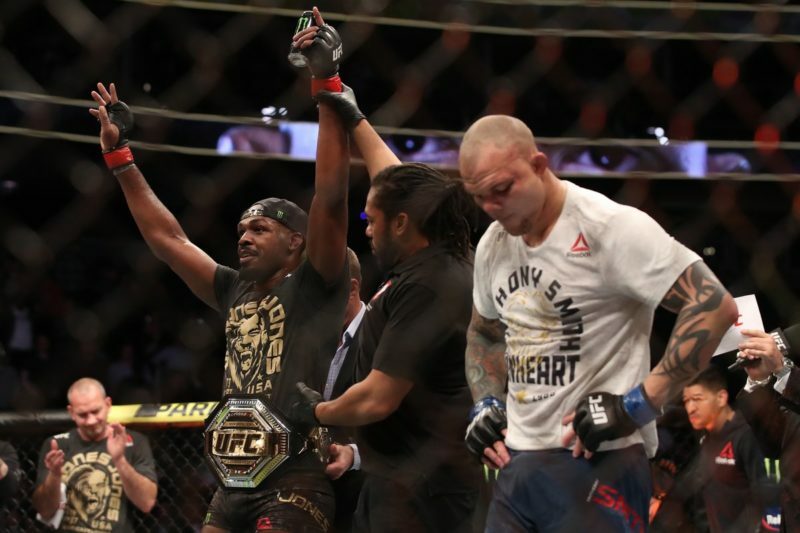 What we saw from Jon Jones during his bout with Anthony Smith at UFC 235 was exactly what we expected: a dominant performance over his opponent with a slight breach of the rules. While the illegal knee that cost Jones two points was plausibly an accident, what wasn’t accidental was the way that Jones dismantled Smith. As we have seen time and time again, Jon Jones is simply better than the rest of the division. Let’s take a look at how Jones was able to implement his favorite tactics to retain his UFC Light Heavyweight Championship. 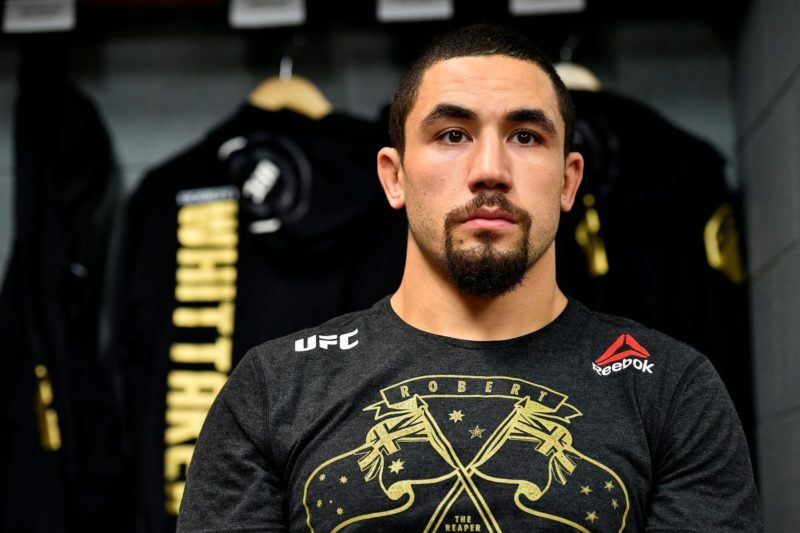 While Jones’ performance was primarily made up of the tactics and moves that he has utilized so effectively previously, one new tactic he employed was forcing Anthony Smith to remain in an orthodox stance. Repeatedly throughout the bout whenever Smith would switch from an orthodox (left foot forward) stance to a southpaw stance (right foot forward) Jones would immediately punish him with devastating leg kicks. In this clip below, Smith starts in an orthodox stance, yet switches to a southpaw stance. Immediately Jones deploys a punishing leg kick, and Smith decides to return to an Orthodox stance to protect his leg. 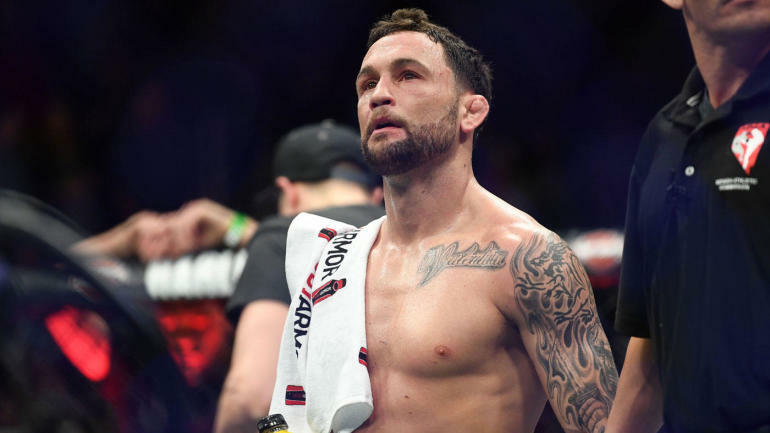 There are a few reasons Jones would want to keep Smith in an orthodox stance. The most prominent is that it is easier for Jones to study and counter the attacks of his opponent if they are always coming from one stance as opposed to two different ones. If Smith only attacked from an orthodox stance Jones would have a much easier time deconstructing his offense than if Smith was constantly changing stances and varying up the style of his attack. Along with mitigating Smith’s offense, forcing his opponent into a southpaw stance gave Jones multiple offensive options. While he is dangerous from both stances, Jones does appear to prefer a “mirror” stance, where he is southpaw with his right foot forward, and his opponent is orthodox with their left foot forward. While Jones used this position to throw powerful left leg head kicks, he also used it to set up single-leg takedowns. As this “mirror” stance brings the fighters’ front feet very close together, Jones could launch into single-leg takedowns as he does in this clip below. If Smith had been in a southpaw stance his left leg would have been back, forcing Jones to travel further to get to the leg and leading to a crummier shot. Although the original shot was unsuccessful, Jones used the single-leg attempt to come up into an upper body clinch, the position he used to dominate Smith throughout the 25 minutes they shared in the Octagon. 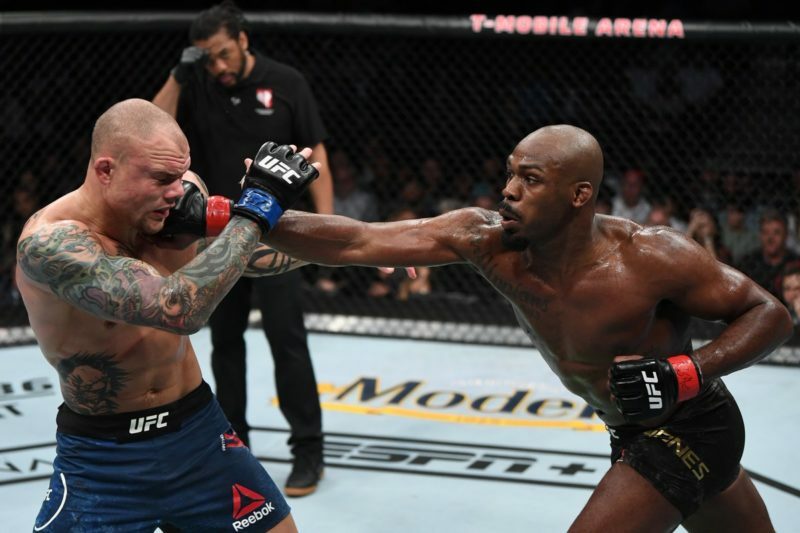 Part of the reason why Jon Jones looked so dominant in every realm of this bout was that he was able to weather Anthony Smith down through the grueling application of the clinch. 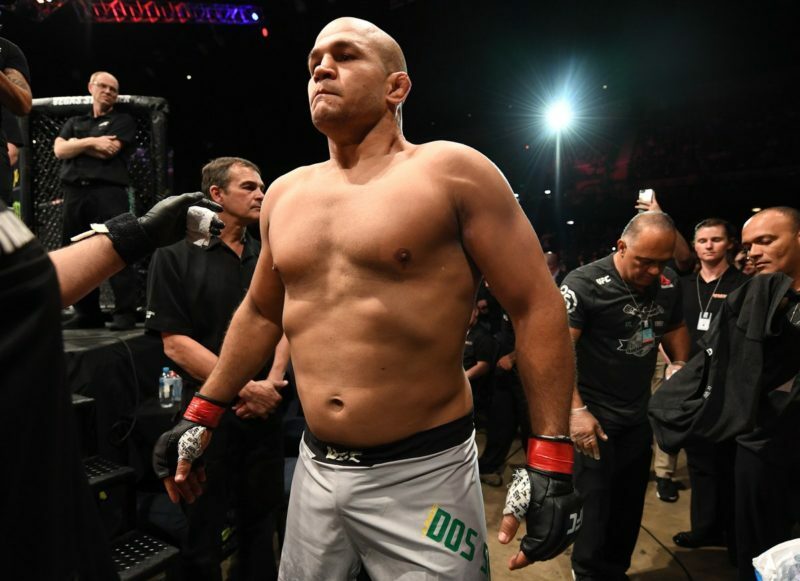 This is not to say that Jones is not a superior ground grappler or striker to Smith (he is), just to say that the reason why he looked so superior is due to the fact that he was able to beat Smith up so badly in the clinch that he had very little stamina left for when the fight went to the mat or returned to striking range. 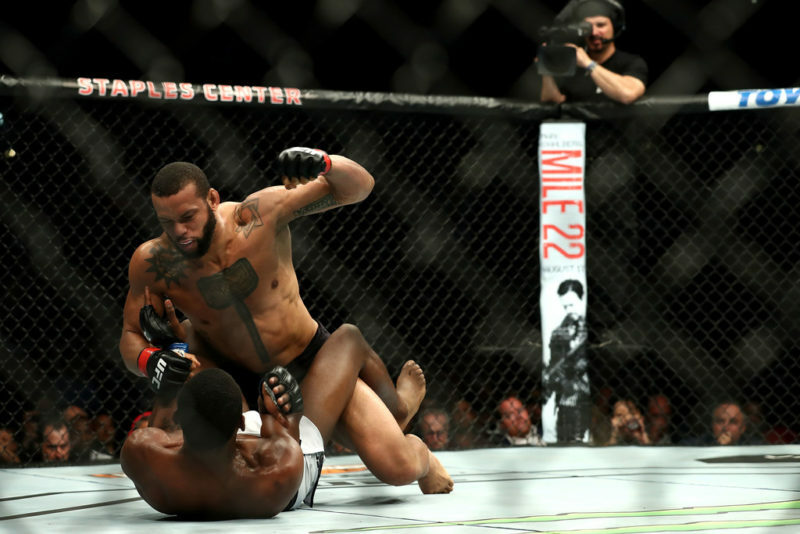 One maneuver that Jones has used throughout his career to beat up opponents in the clinch is his patented shoulder strike. What makes this strike so useful is that unlike a punch or an elbow the shoulder strike does not require Jones to let go of his opponent’s hands to throw it. So, while an elbow may be damaging, it requires that the attacker let go of the opponent’s wrist and sacrifice control. The shoulder strike does not, so Jones can hurt and attack his opponent simultaneously. Not only are shoulder strikes effective, to avoid them the opponent will have to stand up, opening up their hips to a takedown. Here Smith is standing upright in an attempt to move his head further away from Jones’ shoulder and mitigate the impact of a strike. Seizing on his opponent’s defense Jones changes levels, locks his hands around Smith’s hips and takes him down. Jones was only able to get access to Smith’s hips so easily because he had stood up straight to defend against the shoulder strikes. One of Jones’ greatest skill is his ability to trap his opponent’s hands in a way that allows him to control and strike them simultaneously. At the risk of sounding too obvious, a fighter will gain a massive advantage if they can control multiple of their opponent’s limbs with only one of their own, freeing up the other hand to grapple or strike. Jones has taken this concept to a previously unseen level as he can control his opponent’s limbs, and sometimes the entirety of their body with the least amount of limb-commitment possible. Here we see Jones has snaked his right arm under Smith’s left and grabbed ahold of Smith’s right wrist. Now he is free to strike Smith’s body and head repeatedly with his left hand, as Smith’s right arm is trapped and his left is too far away to defend. Notice how Jones keeps his body on the left side of Smith’s pinning him to the cage and preventing him from circling behind him to take his back. 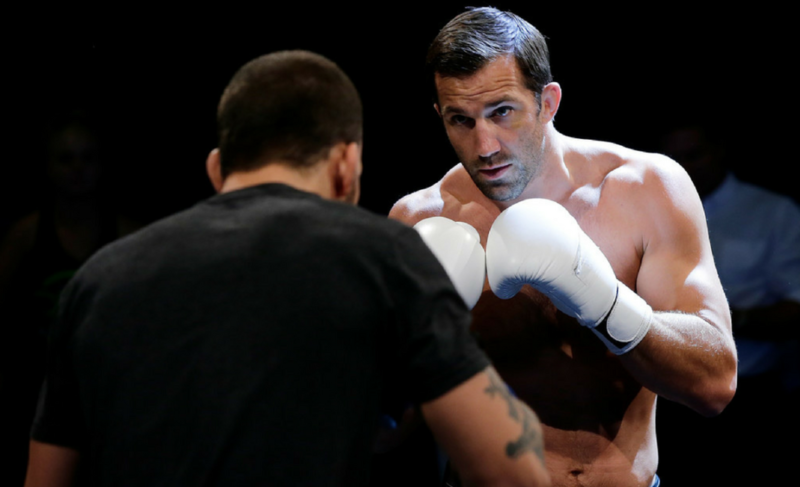 This is one of Jones’ favorite tactics as he has used it extensively throughout his career, punishing his opponents with punches, elbows, and shoulder strikes while they are nearly incapable of defending. Not only does Jones use this tactic on his feet, but on the mat as well. While wrist rides are a staple of modern wrestling, Jon Jones has brought the technique to its full MMA potential, paralleled only by the lightweight champion Khabib Nurmagomedov. Here we can see Jones has Smith in the turtle position and has captured Smith’s left wrist by threading his right arm under the body and seizing control. From here he can throw powerful shots with his left as Smith is unable to defend. Notice how throughout the clip Jones circles to his left towards the trapped arm. This allows him to get a perpendicular angle and inflict more damage on his opponent. While we didn’t see very much from Jones that we hadn’t seen before, we didn’t need to. His strategy and tactics work very well, and there doesn’t seem to be any reason to change them. What makes Jon Jones’ antics with banned substances and illegal strikes (as we saw in this fight) so frustrating to fans is that Jon Jones is the best fighter to have ever competed in the UFC light heavyweight division. As we saw in this bout with Anthony Smith, he is levels above the rest of the division when it comes to his technical abilities as he can beat opponent after opponent with relative ease. While Jones deserves criticism for his illegal moves and consumptions, at the end of the day he is still is the light heavyweight GOAT.